Mr. Macron said France would launch a campaign to rebuild the cathedral, which is considered to be among the finest examples of French Gothic cathedral architecture, including fundraising efforts and by appealing to “talents” from overseas to contribute. “We will continue to watch over any residual pockets of fire and cool down the areas that are still red-hot, like the wooden beam framework,” a fire brigade spokesman said in the early hours of Tuesday.Distraught Parisians and stunned tourists gazed in disbelief as the inferno raged at the cathedral, which sits on the Île de la Cité, an island in the River Seine and marks the very centre of Paris. 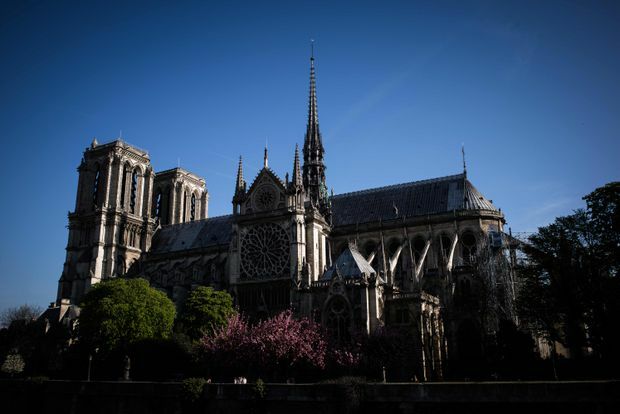 The Crown of Thorns, a Catholic relic, and the tunic worn by Saint Louis, a 13th century king of France, were saved, Notre-Dame’s top administrative cleric, Monsignor Patrick Chauvet said. But firefighters had struggled to take down some of the large paintings in time, he said. Mr. Macron cancelled an address to the country that he had been due to give on Monday evening in a bid to answer a wave of street protests that has rocked his presidency. Instead, he went to the scene of the blaze with his wife Brigitte and some of his ministers. He thanked and congratulated emergency services and firefighters. A file photo taken on April 17, 2018 shows the Notre-Dame de Paris cathedral. ning. The spire and part of the roof collapsed. of the damage is not yet known. full extent of the damage is not yet known.